The 5GIA and 5G PPP projects were strongly present at MWC 2017. The Press Event organised by the 5GIA was successful. It attracted around 160 participants from almost 30 different countries. Journalists and analysts but also MNOs, universities, vendors and chipset manufacturers attended the 2-hour conference opened by Mr. Roberto Viola (Director General DG Connect, European Commission) and moderated by Jean-Pierre Bienaimé (5G-IA). The members of the 5G Infrastructure Association have hosted the press, media and ICT industry analysts at a briefing on the evolution of European 5G initiatives from Research to Trials at Mobile World Congress 2017. The event was held on the 28th of Feb from 14:00 to 15:30 in the Press Conference Room 1, in the Media Village at the MWC in Barcelona. 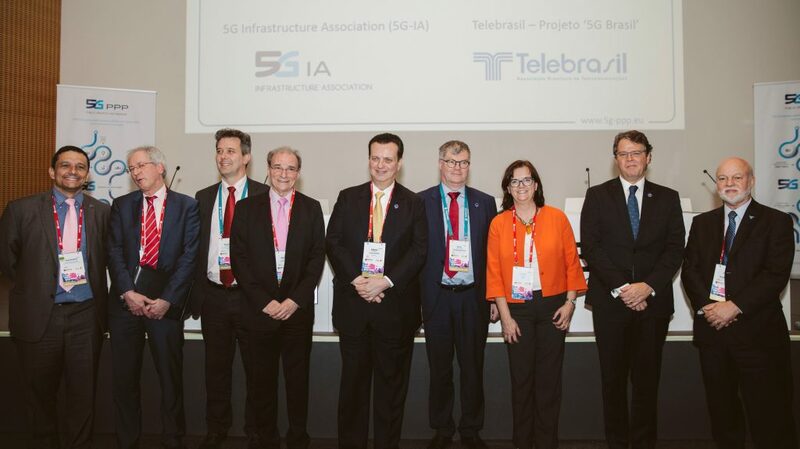 At the end of the Press Event, the 5G-IA and the Telebrazil Projeto 5G signed a Collaboration MoU to foster industrial collaboration on Research, Standards, Regulation and Policies over the next three years, particularly on 5G. European Alliance for Internet of Things Innovation (AIOTI) and the Brazilian Internet of Things (IoT) Association, Câmara IoT. 5G PPP projects showcased demos, organised panels and sent keynotes speakers. This year, 5G has grown a lot and pre-commercial services should be launched in the USA in 2017. In the longer term, 1 billion subscriptions are anticipated until 2025 according to the MWC’s organiser. We did not identify any example of real innovation in this 2017 but rather the continuation of last year’s developments. However, there is much pressure set on the 3GPP to speed up the standardisation process! A number of leading MNOs (AT&T, NTT DOCOMO, South Korea Telecom (SKT), Vodafone Group, BT Group, Telstra, KT Corp, KDDI, Telia Company, Swisscom, Telecom Italia (TIM), Etisalat, Sprint, LG Uplus and Deutsche Telekom) and equipment vendors (Ericsson, Qualcomm Technologies, Intel, Vivo, LG Electronics, Huawei and ZTE) at MWC called for an acceleration of the 5G New Radio (5G NR) standardisation process (i.e. Release 15). The objective was to enable large-scale trials in 2019 instead of 2020. The group suggests to add a intermediate milestone (set by the end of 2017) to complete specification documents. Verizon, Samsung and Nokia voted against. The group succeeded and the 3GPP agreed early March 2017 to develop an intermediate standard for 5G to be ready by March 2018. Few equipment vendors showcased 5G base stations operating on millimetric frequencies and on sub-6 GHz bands. Nokia showed its 5G FIRST end-to-end solution. It incorporates AirScale massive MIMO adaptative antennas, the cloud packet core network and the Intel’s based mobile transport network platform. Nokia and Intel will collaborate on commercial deployments later in 2017. 5G FIRST is based on specifications defined by the Verizon 5G Technology Forum and is the basis of 5G pilots being deployed in 11 US cities. Ericsson, Qualcomm, NTT DoCoMo and Telstra announced their plans for interoperability testing. A few days before the MWC, Samsung announced a 5G Radio Base Station (a 5G access unit) and core network infrastructure, among others. They will use the 28 GHz band in the USA. On a longer term, additional bands could be used. At last, cloud-based technologies were also present on equipment vendors’ booths this year. Verizon and AT&T anticipate launch of 5G fixed wireless access services in 2017. In particular, Verizon is trialing the ability of its 5G fixed wireless service to transmit 4K video. This kind of service is easier to implement because it is stationary and there is no battery limits to consider. this first commercial service will help validate the use of millimetric frequency bands, massive MIMO and beamforming. Questions remain however, regarding what kind of antennas will be used: indoor or outdoor? This has a direct impact on the service scope. What will be 5G use cases? Few questions were raised on “good” 5G use cases. From the MNO point of view, “good” use cases are those that can be easily monetised! Many MNOs and analysts stated that network equipment prices have to decrease significantly to be affordable and ensure viable deployment and a lower TCO than in LTE. 5G supporters are betting on very low latencies achieved and on network slicin for B2B services. Augmented reality, virtual reality, autonomous cars, smart cities, drones and IoT for industrial services are poised to be ideal applications with 5G. On this topic, the Deustche Telekom CEO indicated that 5G deployment in Europe would be a 300 to 500 billion EUR investment. What are the prefered frequencies for 5G? Spectrum issues are still very touchy. A number of bands emerge as preferred bands. Tehy however may vary from region to region. The 3.5 GHz band is coveted by Europe and China. The 28 GHz has been identified in the USA and South Korea. The 700 MHz band is also identified for Europe. mmMAGIC, METIS-II, 5G-Crosshaul and 5G NORMA are organising a workshop on RAN architecture and integration on March 30-31, 2017 in London. Day 1 will focus on 5G-PPP work and Day 2 expand the discussion to all aspects of 5G: from Theory to Practice. The workshop is open to all on both days . The Workshop home page, with latest info on the agenda and logistics, can be found here. So far, more than 60 people registered. The 5G PPP projects METIS-II, FANTASTIC-5G, mmMAGIC, 5G-CROSSHAUL and Flex5Gware all have the aim to take the 5G design one step further in level of detail, find consensus on key design aspects such as mentioned above, and prepare a smooth start of 3GPP study items in 2016 and work items in 2017. The workshop will build upon its successful predecessors, focus on the 5G RAN design and provide the opportunity to share and discuss final results from the mentioned projects or other 5G research activities. The workshop is col-located with IEEE ICC 2017 (21-25 May 2017). Papers have been submitted by METIS-II so far. 5G NORMA is organising the 4th International Workshop on 5G Architecture to be held in Paris on 25 May 2017 alongside with the IEEE ICC 2017. It is essential to introduce a 5G End-to-End Architecture that allows for a cost- and time-efficient introduction of 5G, that integrates a variety of novel technologies rolled out in various stages, and that is sufficiently flexible to accommodate applications and services that are yet to be envisioned. For example, to allow 5G to support low latency, it is not sufficient to design a low latency RAN, since latency is an end-to-end factor and hence requires the joint design of RAN, Core and Transport Networks. Hence, the new E2E Architecture will have to be programmable, software driven and managed holistically to enable a diverse services in a profitable way. This requires novel ways of designing the mobile network architecture (radio access, core and transport network), operating the network, and offering interfaces. The workshop aims at presenting recent research results covering need for spectrum and suitability of the frequency bands under consideration, ranging from the sub-GHz to the millimetre range, to provide ambitious services and adequate coverage, especially leveraging the 5G PPP1 projects advancements. Special attention will be given to the vertical industries. Regulatory spectrum availability for enabling timely trials and commercial roll-outs of 5G technology and service provision will be discussed. This is all of crucial importance to the current on-going intentional standardisation, to the European industry stakeholders Manifesto and to the EC’s 5G Action Plan, as also pointed out in the RSPG opinion on 5G spectrum. The workshop will provide introductions and research project results on expected 5G scenarios providing discussion of needed bandwidths, coverage, and availability of suitable radio frequencies. The bands in question are in particular those listed by the RSPG opinion4, particularly 700 MHz, 3.4-3.8 GHz, and 24.25 – 27.5 GHz. ➧Additional information will be available soon here. A number of 5G PPP projects have submitted papers, asked for booths or anticipated to showcase demos o eventually suggested they could organise panels or workshops. Results are not publicly available at the time of writing. ➧Read more here or there.